Surfing tastespotting, I saw a post about a dish at some restaurant - it was a bean mixture topped with a fried egg. Taking into account my fondness for stuffed peppers and the fact that I had some spinach & ham in the fridge that needed to be used, this was the logical result. My personal opinion is that it looked a lot better than it tasted (not that it tasted bad, but it really wasn't spectacular). I think next time I might add some mexican salsa sauce instead of the tomato sauce and see how that goes. 2. Meanwhile, heat oil in a frying pan, and saute onion and garlic for a few minutes until soft. Add tomatoes, fry together for about 5 minutes. Add ham, fry another 3 minutes. Now add spinach, and cook until wilted (it should only take a few minutes). Add spices and stir tomato sauce through. 3. 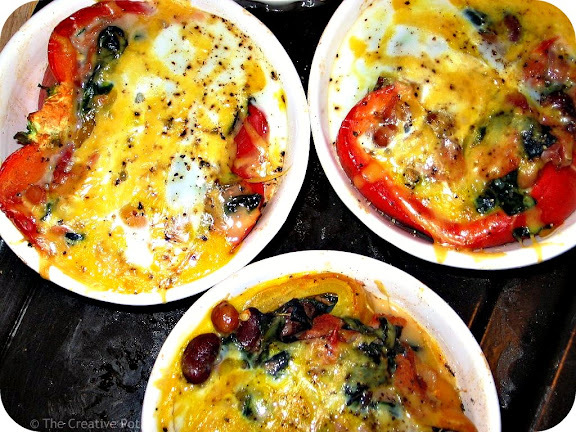 Fill each pepper with the spinach mixture (I found it easiest to place each pepper in a ramekin), break an egg on top, pricking each yolk, season with pepper and sprinkle with a bit of grated cheese. Return to oven and bake for about 10 minutes, or until eggs are just set.